What exactly is the replicator, the tweet or the twitterbot? As mentioned already during the discussion of wagner’s descriptions it seems we can take both perspectives. There are machemes that try to survive by imitating what humans do. They have so many resources that it wont be difficult for them to come really close. In a while they are probably on a medium like twitter not distinguishable from humans and pass the Turing test. 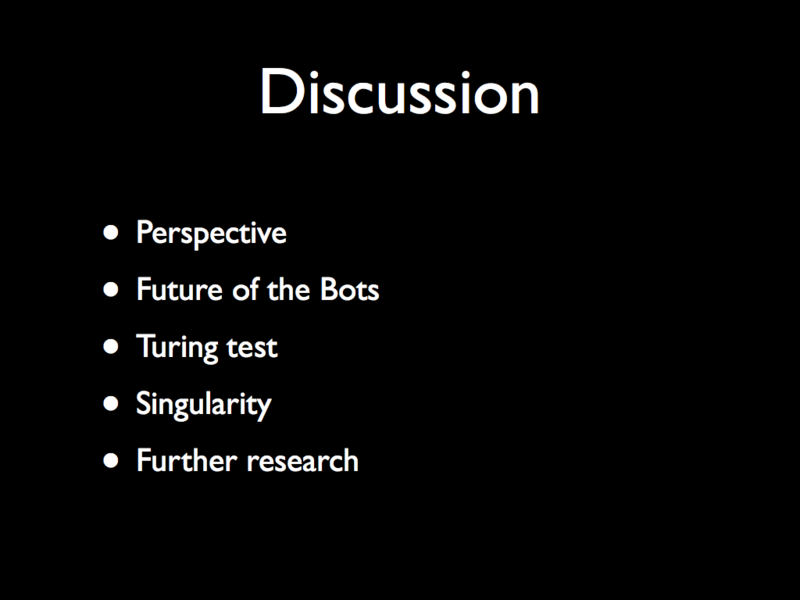 On the other hand machemes will create their own Turing-test. The twitter- algorithm already filter the bots that are not humanly enough. Machemes will give a different perspective on singularity. Singularity will come in a different way than we probably imagine. Further research We can research in more detail the properties of machemes. We can look into a family of machemes. We can study the privacy debate from the perspective of machemes. We can combine existing technological research with the insights machemes will give us. We can research how people react on machemes and see if the uncanny is the same for digital robots as for physical robots. More important at the moment is probably to research how to handle the machemes and how to benefit most of them. Maybe it would be smart to study how we can influence technological evolution.